The document uses an objective statement that clearly identifies the job seeker as a teacher seeking a position in secondary school. Objective statements aren’t always ideal, but if you have a very specific target like this individual, the objective headline is appropriate. 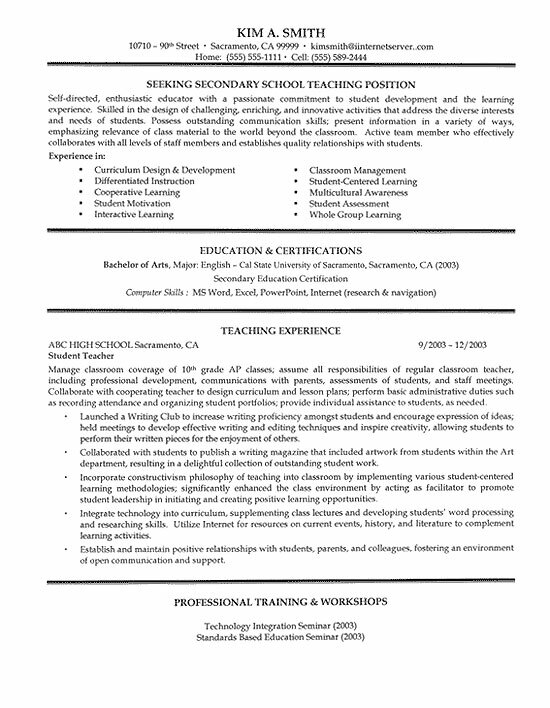 The summary paragraph explains how this professional is enthusiastic and committed to student development. The summary emphasizes the ability to design challenging and innovative activities and address diverse interests of students. Personal skills like communication and collaboration are also mentioned. Below the summary you find a 2 column bullet point list that represents key areas of strength. This lists numerous strengths that include classroom management, cooperative learning and multicultural awareness. The Education section follows, where certifications and her Bachelor of Arts degree in English are communicated. This job seeker has brief experience but provides significant detail regarding the responsibilities at this position. The bullet points represent accomplishments and initiatives that were implemented. Implement a class room that encourages students to meet or exceed standards. Maintain accurate, detailed records of students grades, achievements and behaviors. Develop unit lesson plans, class work and homework in alignment with curriculum. Use of technology and computer systems for daily class work. Use of databases and automated systems to complete grading and progress reports in a prompt manner. Develop curriculum that holds interest and encourages high rates of participation. Ensure that lessons and curriculum comply with policy and regulation of school district. Participate in extra-curricular activities including orientations, open house, school events, sports and workshops. Develop weekly and monthly plans that enable substitute teachers to follow guidelines when necessary.